Kadena Air Base’s 18th Wing held a change of command ceremony on the morning of July 10, with Col. Case Cunningham relieving Brig. Gen. Barry R. Cornish. Kadena Town Mayor Hiroshi Toyama, Okinawa City Mayor Sachio Kuwae, Chatan Town Mayor Masaharu Noguni and Okinawa Governor Takeshi Onaga, who were invited to the ceremony, refused to attend, expressing their protest against U.S. military operations, including the use of the former navy aircraft parking apron and the continuation of parachute drop drills despite local opposition. Col. Case Cunningham worked as a commander at the Creech Air Force Base in Nevada. 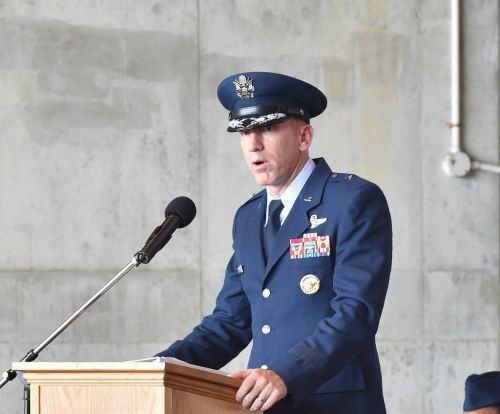 He has served as commander of air-wing level from squadron level.